Balinese gamelan is an ensemble of instruments indigenous to the island of Bali in Indonesia (“gamelan” means “orchestra”). The instruments include small bronze metallophones tuned to a four- or five-note scale, various gongs, flutes, drums and other percussion. 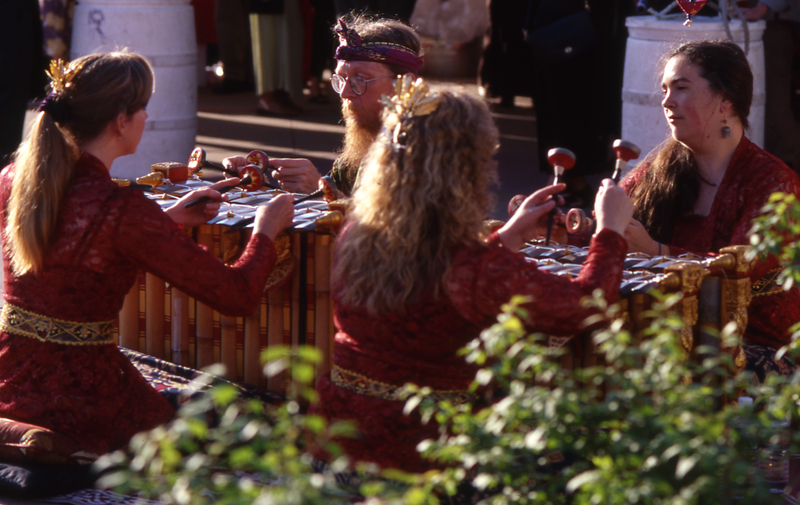 The primary set of instruments used by Gamelan Tunas Mekar is a gamelan angklung (“angklung” means “bamboo”), imported from Bali by Colorado Women’s College in 1976 and now owned by the University of Denver Lamont School of Music. The four metal bars of the instruments, as pictured on the left, are suspended over bamboo resonators encased in hand-carved jackfruit wood. Composition: Kreteg Layang (“Bridge Fly”), composed by I Made Lasmawan, 1991. 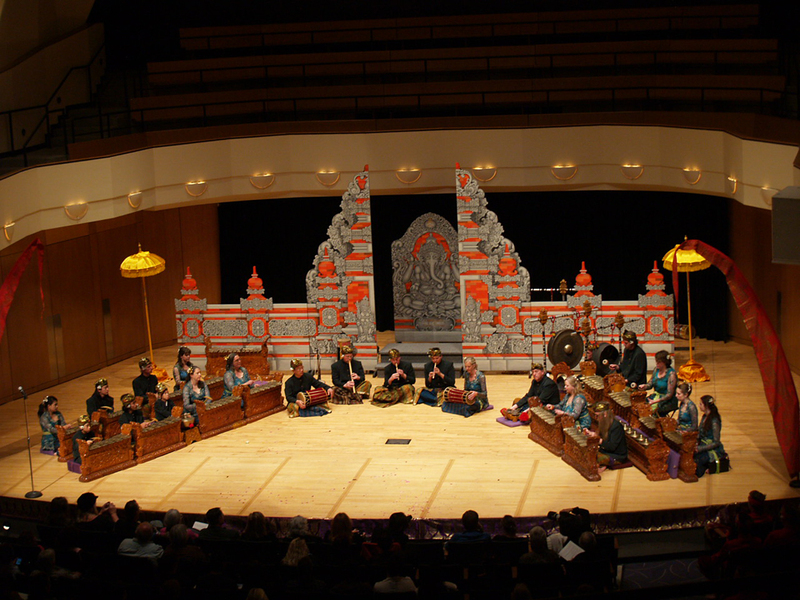 Performed by Gamelan Tunas Mekar on April 3, 2007 at the King Center in Denver, Colorado. The semaradana orchestra upon which Tunas Mekar performs was purchased by the group in 1999. The instruments were hand carved and tuned in Bali specifically for Tunas Mekar. The semaradana was developed relatively recently in Balinese history, and is unique in that it incorporates numerous modes (“saih”) within one orchestra. You will usually hear examples of these different modes throughout a performance. Enjoy this unique, contemporary sound from Bali, Indonesia. Composition: Liar Samas (“100 Liar”). Composed by I Wayan Lotring. 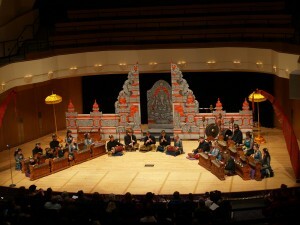 Performed by Gamelan Tunas Mekar on April 3, 2007 at the King Center in Denver, Colorado. Gender wayang is an ensemble of four instruments. Traditionally, the music accompanies the shadow puppet plays (wayang kulit) of Bali. Four members of Gamelan Tunas Mekar and I Made Lasmawan, instructor of the Denver-based ensemble, perform with Gamelan Tunas Mekar and independently in the Colorado region. Pak Lasmawan has bestowed on the orchestra the name Catur Eka Santi which means “four becoming one in peace.” Catur Eka Santi was formed in November 1992 when the instruments arrived from Bali. Jill Fredericksen and Dane Terry purchased the instruments through I Wayan Beratha of Denpasar, Bali. The other members of the group are Frankie Anderson and Merisa Bissinger. Gong kebyar is one type of Balinese gamelan which started around 1914 in the north of Bali. “Gong” refers to either the name of an instrument or the name of an orchestra. “Kebyar” means to burst into light or sound. 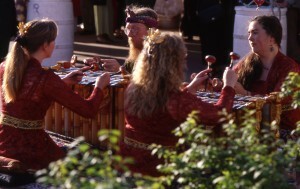 The instruments used in gong kebyar are tuned to a five-note scale called pelog, and they are much larger in size and sound than a gamelan angklung. 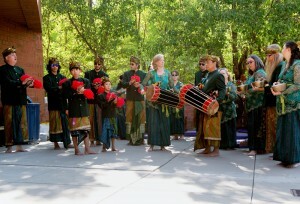 Gong kebyar was originally used to accompany dance. While still filling this role, gong kebyar has evolved into the most expressive form of Balinese gamelan now being performed instrumentally for ceremonies and entertainment. 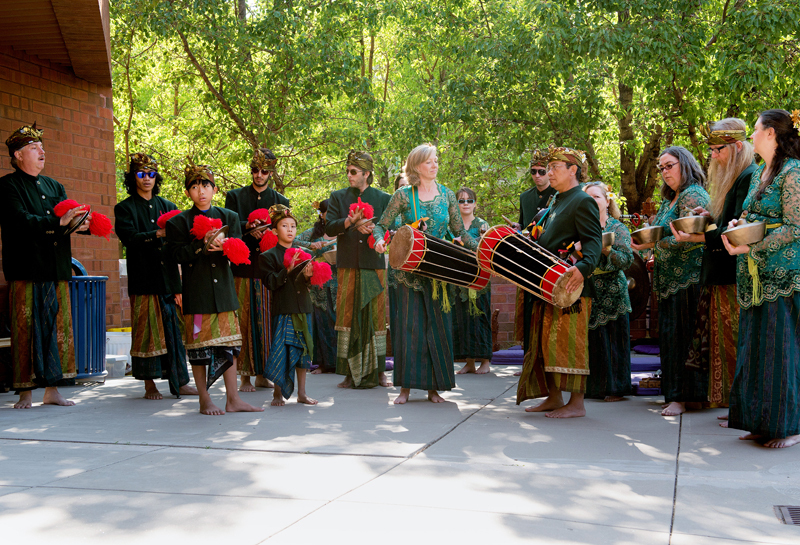 Gamelan Tunas Mekar has performed and recorded music for gong kebyar using instruments owned by the Naropa Uniersity of Boulder, Colorado. Joged Bumbung is comprised of bamboo resonators lying horizontally and tied to bamboo frames. 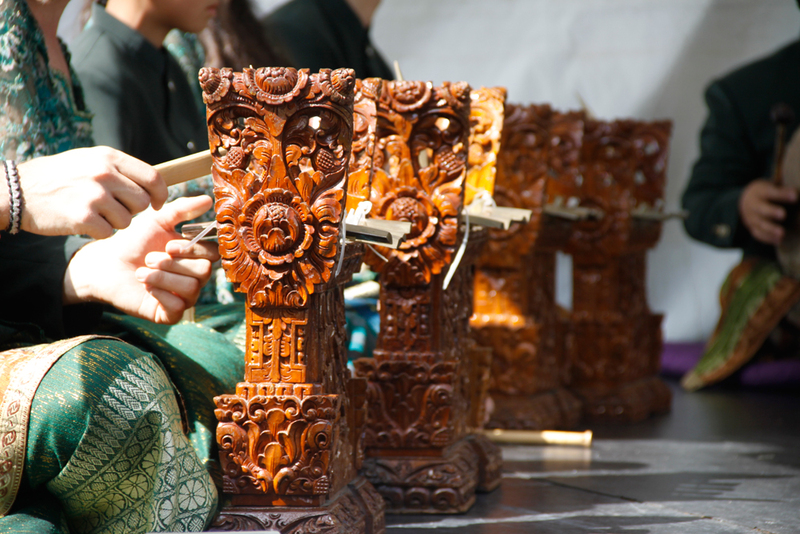 These resonators are struck with special mallets made of bamboo and tire rubber. Often used for informal occasions, joged bumbung accompanies a dance where the woman invites the man to dance with her by placing a sash around his waist and pulling him into the dance circle. Balaganjur is an ensemble of many cymbals (ceng-ceng kopyak), played with drums and gongs, traditionally used for processionals. The processionals were originally used to create havoc in the villages to chase away evil spirits.